Opposition leader Tendai Biti (file photo). LOCAL Government Minister July Moyo was Tuesday taken to task by MPs over alleged failure to prepare and minimise the massive damage caused by the recent deadly Cyclone Idai in Chimanimani and Chipinge areas. This was when the minister appeared in parliament to brief the house on the state of affairs and government's interventions following a catastrophe that has killed nearly a hundred while more remain unaccounted for. In his statement, Moyo had told the house that 98 have been confirmed dead as per Tuesday morning count while 271 were still missing. Moyo also said government has been informed that some 300 bodies have been seen floating in Zimbabwe and Mozambique areas adding that government was still going ahead with rescue efforts, even using soldiers to take food and medication to remote areas on foot. But this elicited strong rebuke from opposition MDC MPs who felt the Zanu PF led administration failed to handle the disaster. The vocal lawmakers warned government to desist from playing cover-up even on bare cases that have since been witnessed by legislators. Zengeza West MP Job Sikhala branded Moyo a liar after the minister had indicated that the army had helped lift bodies of student cyclone victims from St Charles Luwanga Catholic Secondary School. Sikhala told the house that boys, some as young as 12, helped their seniors carry their colleagues' bodies to the nearest accessible place as soldiers and police were having difficulties in accessing the school due to bad weather conditions. "Minister do not lie to us," Sikhala said. "We are adults and members of the House of Assembly. Dead bodies of students were carried by the school's headmaster and the students." Manicaland proportional representation MP, Lynette Karenyi weighed in. "I hear people are being buried in mass graves. Is that proper? It is so sad when a cabinet minister tries to distort information when the truth is known by many. "The school boys carried the dead bodies on their own using logs." 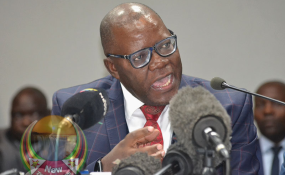 Harare East MP Tendai Biti questioned Moyo on why government had not done anything in preparation for the tragedy when it was aware of the damage caused before by earlier disasters such as cyclones Dineo, Eline, Japhet, among others. "With the vast experience of cyclones Japhet, Eline and Dineo, government is yet to learn from these disasters and cannot even do the least to avoid loss of life. What did you do minister to avert this tragedy?" he said. Mutare MP Prosper Mutseyami also questioned why government was failing to assist victims the same way equally affected countries such as Mozambique and Malawi had sought help in the form of helicopters from South Africa to contain the situation. However, in his response, Moyo blamed western imposed sanctions on Zimbabwe and social media for the disaster. He also said that through its structures, government did its best to inform the public to leave the areas which were targeted by the disaster but most of them failed to heed the warnings. "People were informed about the cyclone. Those who listened survived. Management committee was everywhere in the districts of Chipinge and Chimanimani and others," Moyo said. "I warned people through our traditional structures which work with the District Administrators and Chiefs and Headmen in all those areas. "People do not want to move from their residents. The social media too has generated a lot of fake news regarding this calamity." He added, "When we talk of sanctions, you think we are not being honest, but these are some of the consequences of sanctions where we do not have enough to prepare for any calamities."